With the arrival of the new year we always expect new amazing beauty and fashion trends, always something better than what we experienced with in the past year hoping that the worst of fashion would be forgotten in the pages of the year gone. Fashion brought some really weird trends in 2014, popularizing clothing pieces and accessories, which weren’t meant to make you look beautiful, but rather comfortable. From jackets and coats resembling bathrobes to pajamas worn as “elegant’ suits, some really questionable pieces became bestsellers in 2014. According to today’s standards, fashion is more about feeling and looking comfy, so gone are the days when women were sacrificing their comfort over style wearing heels in order to appeal to men. When imagining us wearing such “weird’ trends a few months ago, we’d definitely laugh heartily, however, that’s the power of fashion ” convincing us and converting the initial rejection to the final wish and the controversial piece of clothing into an It item. After all, it’d be really boring if the feminine style and sophisticated minimalism triumphed every single year. We definitely need the normcore style too and the sporty chic, as well as some weird combinations like sandals worn with socks, or more elegant ensembles accessorized with punk rock or sporty details. Nevertheless, these are the fashion trends that should die in 2015, as we have had enough of them and need something fresh and more eye-pleasing now! It was Moschino that brought the Fast Food obsession to the fashion scene, unveiling a collection where McDonalds became the centerpiece and one of the most powerful aesthetic emblems of the year. We have seen many It girls, popular fashion bloggers and celebrities, who fell for the new trend of combining luxury with pop culture elements. Other luxury brands and high-street retailers also started using the same motifs on bags and clothing pieces, making us all feel fed up with all the McDonaldsization of the prints and colors. So it’s definitely high time to leave this crazy trend in 2014 and think of better ways of standing out in the crowd in 2015. Despite its popularity, pajama fashion couldn’t manage to convince everyone to become its followers in 2014. Well, funny onesies and pajama style shorts and pants can be extremely comfortable to wear at home, but come on, we don’t want to see how you dress at home when you are out. In a few months, you’re definitely going to laugh out loud when recalling yourself strolling in the city wearing a tiger onesie or a pajama suit. We definitely need comfy shoes to wear in summer, however, that can still be something stylish. The normcore style brought the trend of ugly shoes with it, and although they are perfect footwear options to wear when going shopping or being out and about with your friends in the city, those aren’t the perfect shoes to wear with every type of clothing, especially when you are more into the elegant style. We have even seen celebrities wearing pool sandals with socks in the middle of August, and well, it may be logical, since that was considered trendy, but let’s leave this tendency in 2014 too! 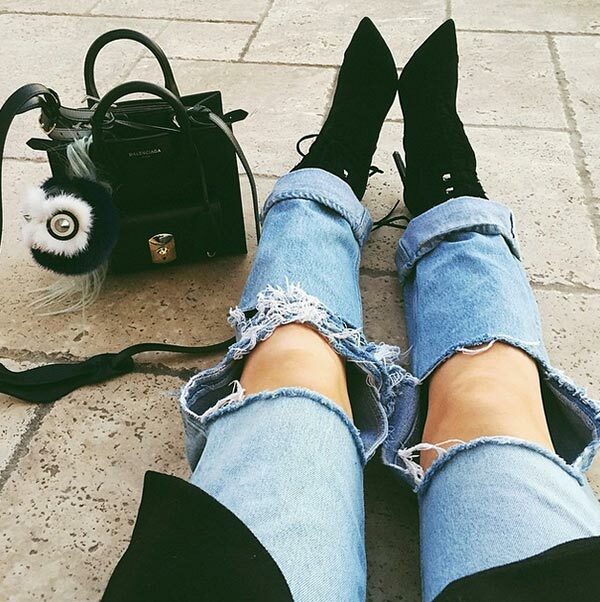 Ripped jeans have always been considered trendy, sometimes gaining more power and sometimes giving their way to classy jeans. This summer however, this trend was already getting out of control. We have seen celebrities and fashion bloggers wearing very (but extremely) ripped jeans and shorts, which looked quite unflattering having no proper shape and style. It’s hard to understand the message of this trend and we definitely don’t want to see it any more in 2015. The trickiest material to wear derives from the fetish style and it can look quite dangerous and vulgar even on the tallest and skinniest model. Some celebrities like Kim Kardashian prefer to wear it on multiple red carpet events to attract extra attention, however, we don’t advise you to follow in their footsteps, as the result might be a big style blunder. Everyone strives to have Angelina Jolie lips, and most of us look for makeup tips for getting plump lips, using contouring methods to achieve perfection. Makeup can really do magic, however, unless you are professional enough to use the right tools and products to create the illusion of bigger lips, you’d better give up this idea. Kylie Jenner might be a pro at applying lipstick (on her lips and the surrounding area), yet not all of you might end up with the same results. So let’s keep it natural and sophisticated, especially when the no makeup style is so popular this year! Cara Delevingne brought the trend of powerful brows and “trendy’ girls learned how to fill in their eyebrows to get her signature look. Then popular makeup artists started showing their own versions of powerful brows, bleaching or dyeing them and some even used piercings as brow decorations. We can’t imagine where this brow obsession is going to, but we are sure it’s one of the trends that need to die in 2015.